game publishing company they were. Three amazing games in 1983... and then gone. This Geeklist is a WIP as I'm currently trying to get some background on Aulic Council and will update as I learn more. I welcome input from anyone who would like to contribute information, opinion, or commentary on this short-lived, but impressive publisher. We had a circle of gaming friends fluctuating from 4 - 6 guys, that met very regularly at Tom's loft in Soho. Games hit the table, got played, discussed, critiqued, and tweaked. A subset of us fell into the habit of meeting Sunday afternoons. There we put aside our favorite games (Junta, Quebec, Emperor of China, and even Monopoly sometimes among them) to pull out sheets of map paper, blank counters, markers, notebooks and dice and, well, experiment. We had incredible fun designing games such as "Trapped Like a Rat" (you are a rat trying to find your way out of a scary, dangerous house filled with prowling cats and sadistic kids), "Marvelous Party" (you and your spouse attend a party filled with all kinds of wild characters, and you're out to have fun, get drunk, and score! ), and even a card game on Roman politics, anticipating the Living Card Game craze of today. Many other designs were born, lived briefly and died on Tom's kitchen table. Typically, we'd work and design and play until we reached an impass ... we'd all stop, stare and finally one of us would reach out, gather up the sketched board, drawn pieces, etc. into a crumpled ball and trash it. Deep breath, on to the next game. By this time the 'core team' had whittled down to 4 of us, Tom, Vincent, Rick and myself. For some reason it tickled our fancy to design a game about Jack the Ripper. Each of us read different books on the topic to get some background and off we went. Out came the counters, map sheets, dice, etc. The iterations were amusing. At some point we had a class based system that basically allowed an upper class character to do pretty much anything since the lower class police couldn't question him! Visualize the Queen's grandson killing his victim while a lower class copper stood by, holding the noble's coat and brolly. Well, after some time we got to that impass ... we were stumped on how to keep character counters anonymous while on the board. It was all over, and one of us was reaching out over the mess on the table to gather, crumple, and toss. But then thunder struck! One of us had a bright idea of stacking counters on counter to hide their identity (I think that mechanic made it into the game, too). Then, we were off and the design reached completion. We actually tried to sell the design ... Avalon Hill's rejection letter was filled with loathing and contempt that we'd even think they would publish a game about murder and crime (that's before they published their Ripper computer game about 6 - 9 months later!). Tom was already in the game business, and had the exciting idea to form a company and publish ourselves. And so Aulic Council was born. "Aulic Council games and inventory I sold to Sleuth. Hannibal recently bought from Sleuth widow and reissued thru Glenn Kidd, its designer. Aulic Council was the inept Advisory Council to the Holy Roman Empire. The game company motto was 'Death Before Boredom' in Latin (you can see it on the logo on the box). Aulic Council Publishing LLC was us. Glenn & I were the General Partners, everyone else a limited partner. Company failed because we decided to gamble on releasing 3 games instead of one (Jack the Ripper) in hopes of taking advantage of distributor minimums to pay the increase production costs and get thereby a fast start - every other game company had the same idea that year and the market was flooded." I'll add that Mohawk was my favorite game of the three ... inspired by Quebec 1759 (which we regarded as a mystic experience, not a game), it really gave me the feel for the 18th century wilderness warfare. I guess I was burned out on Jack the Ripper, and never really had the chance to play much Hannibal. In closing, I'll reveal to you a bit of Aulic Council trivia that is very little known. If you look at the company logo you will notice that one of the three headed eagle's heads is asleep. Why? Well, during our long design sessions it seemed that while two of us would be engaged and deep in the design process, the third was phased out. Staring at the ceiling, counting his teeth, humming tunelessly. Then suddenly, he'd have a bright idea and jump into the process, fully animated. But before long, one of the other of us would glaze over and lose contact with the work. And so on, with each of us taking turns doodling and napping. So, it seemed to us that one of us was always 'asleep' while two were working. Thus, the sleeping eagle head! Thanks for asking about Aulic Council, it's good to know that our work is enjoyed even today. This got played so often, that I had to buy a second copy due to counter wear. I've also got a PC version of this with AI that performs eerily like another human. 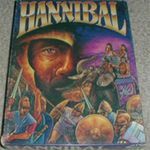 I've got nine other Second Punic War games, and none can hold a candle to this one, including Avalon Hill's "Hannibal" (yes, I know: heresy). I recently got my hands and on this. What a great game! It just amazes me that something this innovative was around in 1983. So much thought went into it. It combines grand strategic, operational, and tactical levels seamlessly. Another recent acquisition, so I've only played this twice. A great cat-and-mouse game that actually manages to generate suspense and apprehension. How many games have an ever-increasing number of bloody corpses filling up the board? As the Inspector, you will find yourself becoming concerned with your reputation. As the Ripper, you get to taunt, mislead, and strike at will, yet must act with a certain amount of caution so as not to get caught. One of these nights, we're going to play this by candlelight.